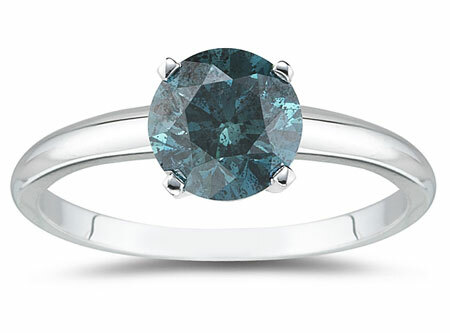 The timeless solitaire gets a colorful makeover in this 0.50 carat round blue diamond solitaire ring in 14K white gold. This eye-catching ring features a brilliant round blue diamond, a half carat in weight, and showcases it simply from a four-prong setting of 14K white gold. This vibrant, sparkling gem is set on a shining 2.5mm-wide band that allows the beauty of this stone to speak for itself. Its classic styling assures that it will always be in good taste, while its blue dazzle allows it to look perpetually fresh. We guarantee our 0.50 Carat Round Blue Diamond Solitaire Ring in 14k White Gold to be high quality, authentic jewelry, as described above.